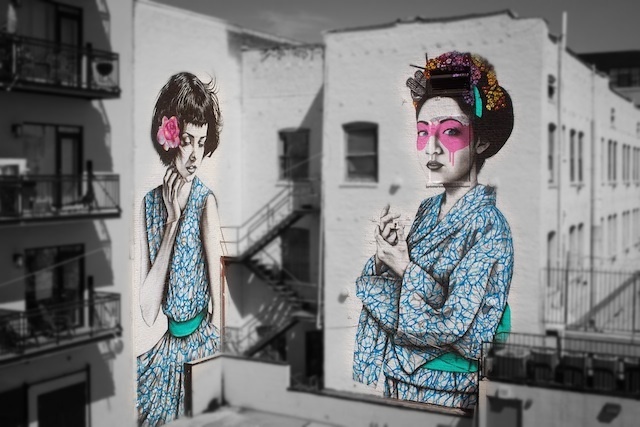 There’s a new mural in Los Angeles — an ab-fab-collab by Fin DAC and Angelina Christina and let me tell you: it’s absolutely stunning! It’s entitled “Upon Reflection” and you can see it for yourself near the corner of Winston and Los Angeles in Downtown Los Angeles. Check it out on Google Street View here. Have patience for this one to load — you’re in for a treat as I’m trying something different. Also, be sure to click this one to full screen to capture every pixel. It’s photographic opportunities like these where I wish-wish-wish I had an aerial pole pano setup to get this shot just right. As it was, this image was one of the more difficult ones to stitch because of that smooth, somewhat featureless parking lot surface. The software was unable to determine any control points so I had to go in and hand-stitch the nadir which took awhile as I was zoomed in at 100%. It was almost like comparing fingerprints! Many thanks to Stephen Zeigler of 118 Winston for making this panorama possible.